Working in the shopping cart migration sphere for over five years, Cart2Cart has unique possibility to monitor tastes of the current online shop owners, and, today, we’ve decided to share this useful knowledge with you. So, which shopping platforms merchants choose to migrate to in most cases? Which solutions have often failed users expectations, disposing them to e-Commerce re-platforming? Are hosted or open-source carts ruling the market nowadays? Here, you’ll find the data driven answers to these and other curious, market related questions. Recently, we have we’ve prepared a descriptive white paper, that graphically illustrates the answers to the uplisted questions, and the main goal of the following article - is to give you a preview of it. Thus, where did e-merchants migrate to the most frequently? Most of the people that hear the words “shopping cart” - immediately think of Magento. Indeed, the platform has been reinforcing its market leadership for quite a few years and, now, more than 30% of our users decide to switch to it. Having gathered our in-house statistics, we’ve received a vivid confirmation of Magento’s market leadership and, also, discovered the names of popular shopping carts that took the second and third chart places respectively. As you can see, Shopify and OpenCart have similar popularity levels, and hold 5th and 6th places in our chart. Meanwhile, BigCommerce and the rest of most migrated to e-Commerce solutions are far behind the market leaders. Which shopping carts online shop owners were trying to escape? Strange as it may seem, the most popular shopping platform of 2014 is, also, the most unpopular one. 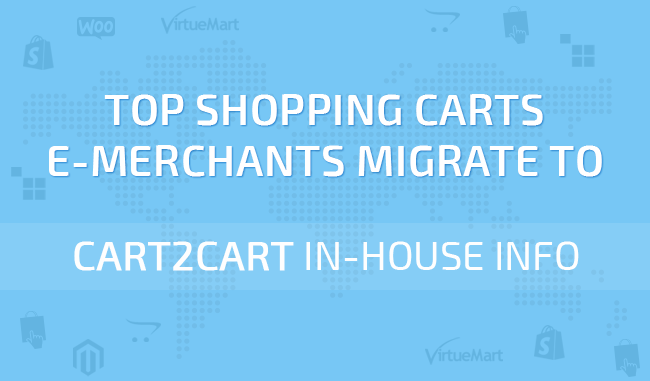 Namely - Magento has been ranked number 1 in both most migrated to and most migrated from Cart2Cart’s lists. “Why is it so?” - you might ask - the reason lies in the option of alternative upgrades, that our service provides. Besides supporting standard migrations, Cart2Cart gives customers an opportunity to switch from the old platform’s version to the new one. 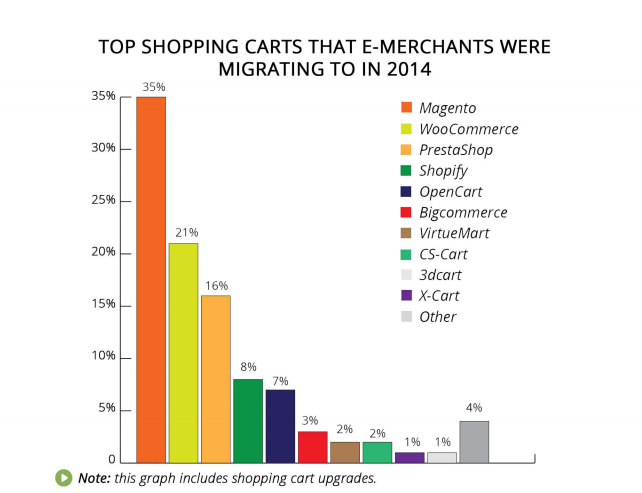 So, keeping that in mind, take a look at the top 3 shopping carts that e-merchants were migrating from in 2014. Check our white paper for a more detailed information. Hosted against open-source. Which type of e-Commerce platforms is dominating the market? Providing higher customization possibilities, a total access to platform’s core code and, therefore, a greater risk - open-source carts are, currently, more preferable among Cart2Cart users. The transfers to the solutions of this type take 85% of our total migrations, largely outnumbering the quantity of migrations to hosted carts. As for the specific transfers within one or two types of shopping platforms, open-source to open-source migrations appeared to be the most popular during last year. Also, we’ve noticed transfers to CMS platforms are becoming more popular among e-merchants as, at this point, they take 3% of our overall migrations. Since e-Commerce market is extremely unsteady and its leaders are getting displaced more often than kings in “Game of Thrones”, e-merchants often find it difficult to monitor the market situation. Therefore, we hope that the uplisted statistics will clear things out for you, at least a bit, and help you make deliberated market decisions in the future. However if you’d like to get a more detailed information that includes top migration trends of the past five years, descriptive data about transfers from Magento Go and ProStores etc. - download our illustrative white paper. Being absolutely free, it’ll provide you with broad, useful stats and ensure that you truly get a grasp on the current e-Commerce market. P.S Despite the fact that Cart2Cart has partner relations with a number of popular shopping carts, this article, as well as the white paper, is by no means promoting them. Our only purpose here - is to present an unbiased statistics, that can be helpful to an e-Commerce community.